Pre-2012: Owens, the 36th pick overall in the the 2011 draft, is the first of four entries from that class to appear in the top ten countdown. The youngest of those four, Owens was seen as a high upside left-hander who could develop into a front-of-the-rotation starter. He had a dominant senior year at Edison High School in Huntington Beach, Calif., going 11-0 and striking out 114 in only 77 innings. Owens signed for a $1.55 million bonus on August 15, the signing deadline, passing up on his commitment to the University of Miami. Given how late he signed, he was not assigned to an affiliate. Red Sox prospects continued to struggle in their respective leagues, but there were a few bright spots in an otherwise poor week. For full statistics, make sure to follow our Fall/Winter League page, which is updated daily. Christian Vazquez (pictured) went 4 for 4 with two doubles and a home run on Thursday, accounting for most of the Saguaros offense in a 6-3 loss to Scottsdale. Vazquez only appeared in two games this week, both at catcher, and he went 0 for 5 with two strikeouts in his other appearance. He allowed five steals, but also threw out five runners. 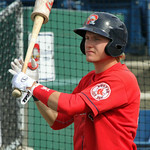 This week, we enter the top 10 as we continue counting down SoxProspects.com's end-of-season top 40 prospects. We will be covering one player a day for the next two weeks, offering a more detailed analysis on the system's top prospects. No player in the Red Sox system is untradeable. However, you can rest assured that there are several prospects that the club won't be "shopping" and won't be traded unless the team is overwhelmed. Players like Xander Bogaerts, Matt Barnes, and Jackie Bradley are part of the team's future plans, and it remains highly unlikely that they'll be traded unless a cost-controlled, above-average regular is coming back in return. But if the organization wants to make a splash in the trade market this offseason, here's a look at some prospects whom the Sox might shop (together with SoxProspects.com ranking). 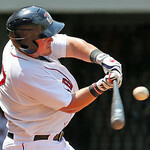 This week, we enter the top 20 as we continue counting down SoxProspects.com's end-of-season top 40 prospects. During the offseason, we will run recaps of the Fall and Winter Leagues each Monday. Also make sure to follow our Fall/Winter League page, with statistics updated daily. The Red Sox delegation played a big role in helping the Surprise Saguaros to a 5-1 record on the week. Michael Almanzar reached base in each of the four games he appeared, scoring five runs on the week. In Saturday's 16-10 slugfest victory over Mesa, he reached base three times, on a double, walk and hit by pitch, scoring two runs and driving in another pair. Christian Vazquez reached base eight times in twelve plate appearances across three games on the week. Bryce Brentz saw limited action, going 1 for 4 in Monday's contest. The Red Sox announced that they have claimed right-handed relief pitcher Sandy Rosario (pictured) off waivers from the Miami Marlins. To made room for Rosario on the 40-man roster, the Red Sox have designated outfielder Che-Hsuan Lin for assignment. Rosario, 27, has gotten cups of coffee after September call-ups in each of the last three seasons. Over those three seasons, he has appeared in ten games, all in relief, allowing 13 runs in 7.2 innings pitched. 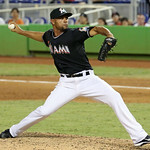 Originally signed in 2006 by the Marlins as a starting pitcher, Rosario was moved to the bullpen full time in 2010. The move proved effective, as he saw his strikeout rate increase, and he moved up the minor league ranks quickly. Making 32 relief appearances at Triple-A New Orleans the past two seasons, Rosario has compiled a 1.65 ERA in 32.2 innings, striking out 28 and walking 7. 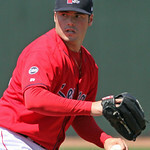 He will compete for a spot in the bullpen in spring training, but with one option remaining, Pawtucket seems the likely destination to begin the 2013 season. 2012 Season in Review: Linares got back on track in 2012 after missing most of the 2011 season when he tore ligaments in his ankle in early May. 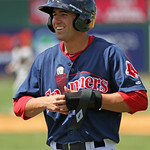 Placed back in Double-A Portland, where he ended the 2010 season, Linares was one of the best hitters in the Eastern League despite playing through injury. 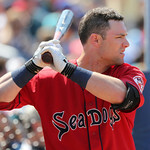 The 27-year-old hit .333/.403/.538 for the Sea Dogs in 210 at-bats before his June 21 promotion to Pawtucket. He continued to show decent power in Triple-A, but walked only seven times in 202 at-bats, leading to a .297/.321/.480 line with the PawSox. Linares mostly played in the outfield corners, but he has shown the ability to play all three outfield positions when healthy. 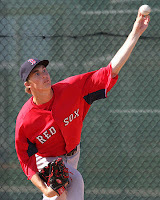 2012 Season in review: There’s no need to be alarmed by Jamie Callahan’s 5.19 ERA with the Gulf Coast League Red Sox. 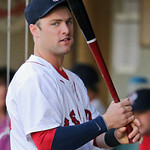 The small sample size of five games does not reflect why the Red Sox selected him in the second round of the 2012 draft. His high school numbers—a 0.89 ERA with 113 strikeouts over 50 innings—are more indicative of his potential. Although he was committed to the University of South Carolina, Callahan signed for a bonus of $600,000. Each off-season, several Red Sox prospects compete in the Arizona Fall League as well as the Caribbean Winter Leagues. The Caribbean leagues consist of teams from the Dominican Winter League (Liga Dominicana de Béisbol Invernal), Mexican Pacific League (Liga Mexicana del Pacífico), Puerto Rican Professional Baseball League (Liga de Béisbol Profesional de Puerto Rico) and the Venezuelan Professional Baseball League (Liga Venezolana de Béisbol Profesional). The teams in these leagues typically play into late December or early January, with each league sending its top team to the Caribbean Series. To follow all of the prospect action this off-season, visit our Fall-Winter League page, which is updated on a daily basis. In addition, this is the first in our series of weekly roundups of the Fall/Winter Leagues - look for coverage to continue every Monday morning into January. This week's roundup covers the period of October 8-14. This week, we enter the top 30 as we continue counting down SoxProspects.com's top 40 prospects, recapping their seasons and why they're ranked where we have them in the site's official end-of-season rankings. 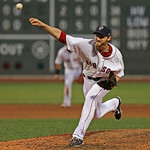 2012 Final Stats: 2-0, 0.90 ERA, 10.0 IP, 3 BB, 16 K, 0.60 WHIP. As the Red Sox embark on the off-season in rebuilding and retooling mode, one positive is that the club has several rookies who could make an impact in 2013. While there aren't many prospects who project to break camp with the club out of spring training (at least at this stage), there are a handful of potential rookies who might be able to make an early-season or mid season jump to the majors, others who could serve as emergency depth options in case of injury, and still others who have the potential to make contributions later in the season. As the off-season begins, and before trade season heats up, here's a breakdown of those options. For the next five weeks, SoxProspects.com will count down its top 40 prospects, recapping their seasons and why they're ranked where we have them in the site's official end-of-season rankings. 10/10 Cup of Coffee: The Arizona Fall League kicked off on Tuesday with six of the seven Red Sox players on the Surprise Saguaros suiting up, along with members of the Royals, Mets, Cardinals, and Rangers. Position players Bryce Brentz, Michael Almanzar, and Christian Vazquez, as well as pitchers Brock Huntzinger, Chris Martin, Ryan Pressly, and Pete Ruiz will represent the Red Sox in Arizona, and all but Ruiz saw action. This year, the offseason Cup of Coffee will feature weekly recaps of all the action in the AFL and Caribbean Winter Leagues, so stay tuned. For the next five weeks, SoxProspects.com will count down its end-of-season top 40 prospects, recapping their seasons and looking at what's ahead for them in 2013. Please note that we will be using the site's official end-of-season rankings, meaning that any moves since September 20 (e.g., the club's acquisition of Rubby De La Rosa and Jerry Sands) will not be reflected in the countdown.